The first elimination came just a few minutes after cards got into the air when the short stack Nico Behling moved all in preflop and Marcel Koller made the call. Behling held A-Q (he had previously moved all in on the first hand at the final table with A-Q but chopped the pot) and he was up against the pocket tens of Koller. The board brought nothing but blanks and Behling was eliminated in eighth place for €72,000. Marko Neumann was the next player at risk and he did so with A-K. He was racing against the pocket sevens of Kevin MacPhee and the board ran out 8-7-6-8-9. Neumann was eliminated in seventh place and he was awarded €120,000, while MacPhee grew his chip lead to 10 million. The eliminations kept coming at a brisk pace when Koller moved all in for 2,395,000 preflop with A-Q and Ilari Tahkokallio made the call with pocket queens. Koller found no help on the board and hit the rail in sixth place. He took home €165,000. Tahkokallio grew his stack to 7 million and looked to have the best chance of chasing down MacPhee at that point of the final table. Almost an hour later MacPhee pulled away from the field again and he grew his stack to 14 million. The extra chips were a gift from Ketul Nathwani, who was eliminated in fifth place and took home €210,000. His A-6 was dominated by the A-9 of MacPhee and the board rolled out 9-4-3-5-Q to seal the deal. MacPhee increased his lead to 23 million before Tahkokallio was able to double up and gain some ground. He moved all in for 5.65 million on 6 3 2 Q board with 2 2 in the hole and MacPhee made the call with K 4 . 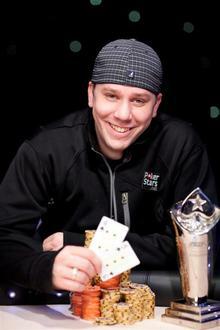 The river brought the 8 and Tahkokallio doubled up to 11.62 million thanks to his set of deuces. Tahkokallio then used his momentum to take the chip lead in a big pot where he induced MacPhee to muck on a 6-4-3-6-A board with a 900,000 bet. He held 15.5 million over MacPhee’s 13 million even. The chip lead then swung back in MacPhee’s favor in the next hand of consequence. On a 7-7-6-Q-J flop with two clubs Tahkokallio tabled 8 5 for a busted open-ended straight flush draw and MacPhee won the hand with Q-9 to take the lead. Tahkokallio was eliminated in runner-up position on the exciting final hand and he was awarded €600,000. That made MacPhee the champion after a heads-up battle that lasted three and a half hours. MacPhee, a 29-year old Idaho resident that plays online as “ImaLuckSac” and qualified for this event on PokerStars, was awarded the huge top prize worth €1,000,000. He also took home the EPT trophy and he now has a seat waiting for him in the EPT Monte Carlo Grand Final in April. The next EPT event will be the Snowfest stop in the Austrian ski resort town of Saalbach/Hinterglemm. The main event will take place on Mar. 21-26.